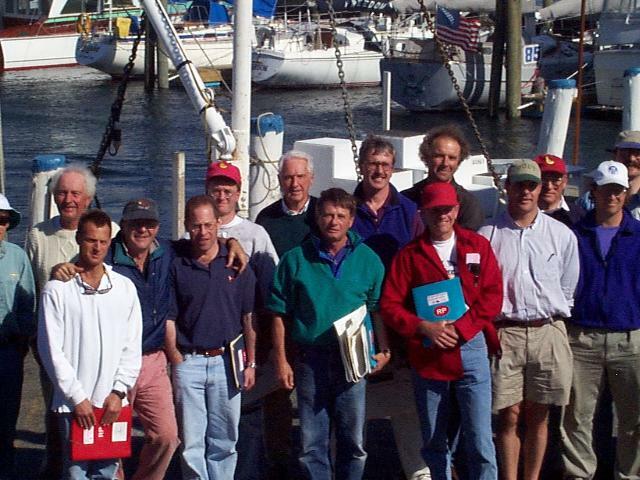 Singlehanded skippers raced from Newport to Bermuda, started Friday, June 6, 1997. 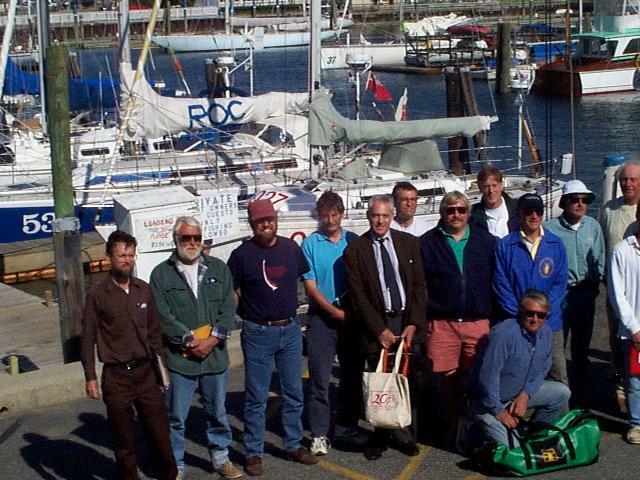 The race back from Bermuda to Newport, started Thursday, June 19, was doublehanded. Under fair skies and a fading northerly breeze 33 singlehanded sailors started the 11th biennial Bermuda One-Two this morning from the starting line in Newport Harbor. The 635 mile race carries the lone sailors across the Gulf Stream to the finish line off St. George's, Bermuda. The fleet ranging in size from 50 feet to 31 feet started in four classes determined by their size and speed. Several boats set spinnakers at their start to take advantage of the following wind and an outgoing tide. However, by the mouth of Narragansett Bay the fleet picked up a wind shift to the southeast and doused spinnakers in favor of a closehauled course to the south. Sailing into the new wind first, the bigger Class I boats Mountain Sky Magic, Alan Brutger at the helm, and Antares with David Sharpe, and Bjorn Johnson's Shere Khan soon were a mile ahead of the bulk of the fleet still stalled briefly between the dying northerly and incoming sou'easterly. The 50-foot California Challenge, scratch boat in the fleet and sailed by Brad Van Liew, was slower getting into the new breeze but at last sight was overhauling her smaller class rivals. In Class II Cabot Lyman with Chewink and Jeff Slegal's Appreciation were off in the freshening new breeze ahead of their competitors with Bob Dresser's 44' Akasia the closest astem. Class III remained tightly bunched into the new breeze and among the smallest and slowest boats in Class IV Peter McCrea's Panacea and Doug Sherer's Nimros took an early lead. As forecast, the sou'easterly had arrived on schedule, forcing the fleet to sail well to the west of the straight-line course for Bermuda. At their weather briefing Thursday afternoon the sailors had been advised to sail west and south with the new wind until the arrival of an expected southwest wind that would let them sail closer to the course for Bermuda. The largest and fastest boats are expected to take less than four days to reach Bermuda, the smaller boats as many as six or seven days. After a week's layover the fleet will start the return leg to Newport with two sailors aboard. There will be prizes forthe leaders on each leg plus overall prizes for the leaders on the combined results for the single and doublehanded legs. 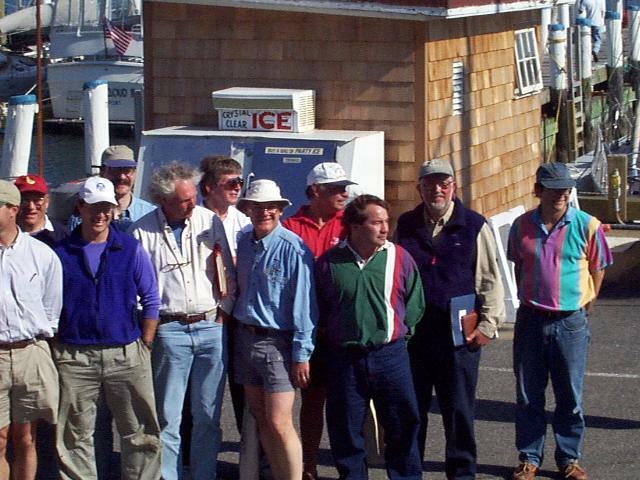 From left to right: Pease, Dixon, Sortman, Hampton, Shearer, Danforth, Dresser, Kuhner (in back), Lyman (squatting), Perez (dark hat), Drozdal, Heywood.